A Holy Ghost Society is unique to Portuguese Parishes. The Society is responsible for celebrating the "Domingas". This is a Portuguese custom in which people gather in homes the the weeks between Easter and Pentecost to pray for the coming of the Holy Spirit. Also since the Portuguese people are deeply devoted to Mary the Rosary is always prayed. Songs are also sung to the Holy Spirit and to Mary. At the heart of the celebration is the crown of the Holy Spirit which is meant to symbolize the royal crown of St. Elizabeth of Portugal. 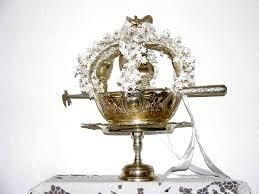 The crown is beautifully decorated in one room of the house with white cloth, candles, and flowers. At the end of this week of prayer the family gathers in the Church at the 10:30am Mass to have the crown placed on the head of a chosen person from the family. The Holy Ghost society is also responsible for the "Soupas" which is a free meal of soup, bread, and meat held on Pentecost Sunday. In our Parish it is usually celebrated on the week following Pentecost. The "Soupas" is preceded by a Procession involving the members of the Society from Somerset Middle school to the Church followed by the feast Mass. The Holy Ghost Society also sponsors two or three suppers in the Parish each year to benefit the Parish. Finally, the Holy Ghost Society in our Parish is responsible for the "Pensao" which is a "gift" of bread, wine, and various meats delivered to the home by parishioners. The "large pensao" is delivered with live Portuguese music and singing. The "Mordomo" or president of the Society is Mr Joao Cabaceiras. The "Mordomo" changes every year.